We managed a couple of CTDs overnight and then a short steam to the next station. The weather has deteriorated again, so while we are sitting here on the next CTD station waiting for the weather to improve (the waves are still too large and dangerous), I will introduce the carbon team: Elizabeth Shadwick (ACE CRC), and Kate Berry (CSIRO). They are analysing water samples to determine the amount of carbon dioxide (CO2) in the water. 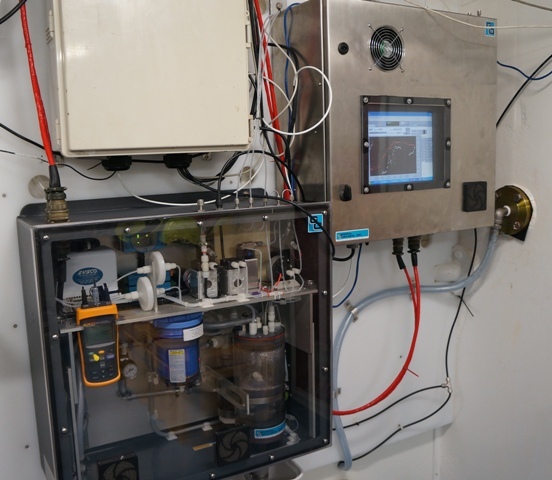 The water samples are continuously being collected during the transit from the ship’s underway system, a seawater tap connected to a pump located about 3 meters below the water surface, on the hull of the ship. They are also collected at different depths in the ocean using the CTD (see blog post 5, The Oceanography Team). The earth has four major carbon reservoirs: the atmosphere, the terrestrial biosphere (including plants, trees, soils and frozen soils or permafrost), the underlying sediments (or rocks, including fossil fuel deposits), and the oceans. The global carbon cycle transfers carbon between these different reservoirs. In pre-industrial times the carbon system was in balance, with the amount of carbon taken out of one reservoir balanced by the input from another. Over the last 200 years or so, however, humans have been burning a lot of fossil fuels, which has taken carbon from the sediments and put it into the atmosphere. This carbon took millions of years to build up in the sediments, and we have released it to the atmosphere MUCH faster. Humans have also been cutting down forests, so there are fewer plants removing CO2 from the atmosphere. As a result, the amount of CO2 in the atmosphere currently is much more than can be balanced by the processes that transfer it out. Roughly half of the CO2 emitted by humans (from burning fossil fuels and cutting down trees) to the atmosphere is actually absorbed by the ocean. The uptake of atmospheric CO2 by the ocean occurs through the combination of physical (the movement of the water) and biological (phytoplankton photosynthesis) processes. Phytoplankton – tiny plants that live in the surface waters of the ocean – convert CO2 to oxygen by photosynthesis, just like plants do on land. The ocean reservoir for carbon dioxide is about 50 times larger than the atmosphere! Since the Southern Ocean is the largest ocean, it plays a major role in the transfer of CO2 from the atmosphere to the ocean reservoir. 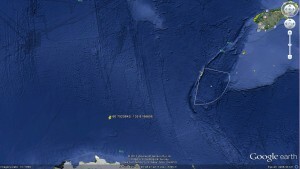 As the RV Tangaroa sails south, we are travelling through different zones of the Southern Ocean. Just south of New Zealand is the Sub-Antarctic Zone, which is separated from the Antarctic Zone further south by a region referred to as the Polar Front Zone. These different zones have different water properties (temperature, salinity, nutrients), which influence the growth of phytoplankton in the water, and the transfer of CO2 between the atmosphere and the ocean. Around 45°S, in the Sub-Antarctic Zone, intense blooms of phytoplankton take up large amounts of CO2 and produce oxygen. The subsequent sinking of these organisms, and the breakdown of their organic tissue, releases CO2 andnutrients in the deeper ocean. The cold, dense waters in the Southern Ocean physically sink below the warmer, less dense waters to the north, transporting both CO2 and oxygen from the atmosphere into the deep ocean. This isolates the CO2 from the atmosphere, and supplies oxygen to deep ocean ecosystems. The deep water currents also transport nutrients to large areas of the global ocean. 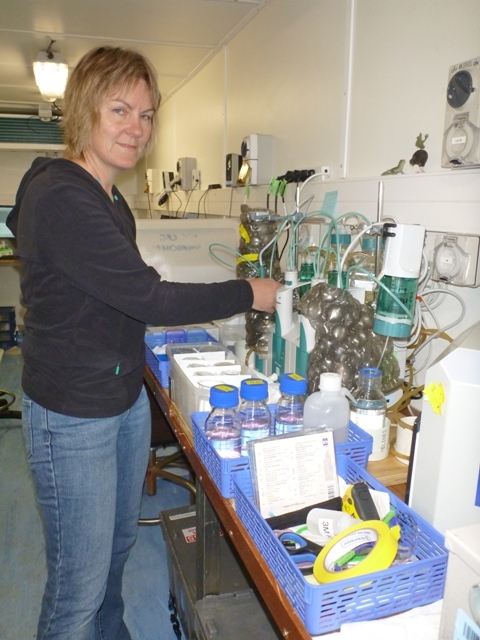 The water samples that we are collecting during this voyage will give us new information about the transfer of CO2 between the atmosphere and the ocean. This data will be combined with observations collected on other ships and over several decades as part of the Australian and French Antarctic Science programs, helping us to quantify the uptake of atmospheric CO2 in the different zones of the Australasian sector of the Southern Ocean. Please be careful suggesting that cutting down trees is bad. Yes there is a GHG problem if we cut down more trees than we replace. Cut down trees that are used for buildings etc and the forest replanted are developing a second staorage of carbon – think of the wooden government building in Wellington and all the carbon they continue to store, long after the trees that produced the timber were harvested over 100 years ago. Secondly, forest products can substitute for uses we currently make of fossil fuels (energy) and for materials that have a high embedded fossil fuel content in their manufacture (steel, concrete, plastic, etc.) It is not the cutting down of trees that is the problem, it is when we do not replace the harvested trees with some others. And while trees are quietly growing and removing carbon from the atmosphere, they are also helping water quality, reducing peak flow flood events, reducing soil erosion, providing recreational opportunities, contributing to our landscapes, harbouring biodiversity, (I could go on). Compare them with a dairy farm.